According to the Union Budget 2015-16, the tax benefit for health insurance has been raised. This means you have got another opportunity for saving additional tax. With the revised tax benefit scheme now you can save up to Rs 65,000 under the section 80D. How much can you save for health insurance premium of your family? 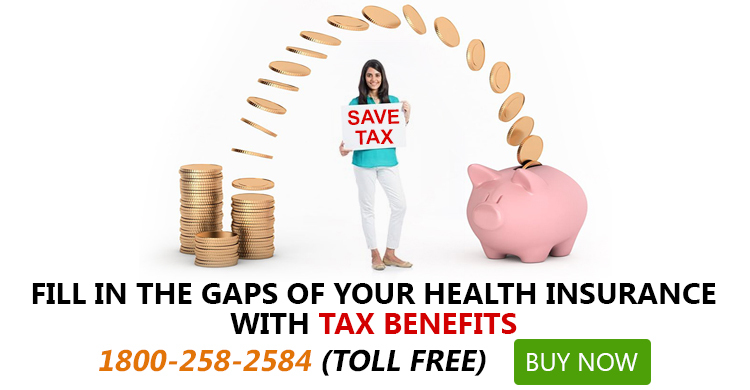 The tax deduction is applicable for paying premium of health insurance. You can claim maximum Rs 25,000 as deduction for health insurance premium for yourself and your family comprising of your spouse and dependent children. In case you are a senior citizen the maximum limit for claiming deduction will be Rs. 30,000. How much can you save for health insurance premium of your parents? Aside from your family, you can also claim deduction on tax for premium of health insurance of your parents. The maximum limit is Rs 25,000 for this deduction and of your parents are senior citizens you can claim as much as Rs. 30,000 for tax deduction. However, this tax deduction does not encompass group health insurance. Although, an insured individual employee pays for the premium he or she cannot claim tax deduction as the health policy is in the company’s name. Sameer works with a private company and he and his family are covered by a group health insurance scheme provided by his company. Even though, his parents are covered by same health plan, Sameer bought a separate health insurance only for his parents. Sameer pays Rs 38,000 as the total premium of his two health insurance plans. How much can he claim for tax deduction? In this scenario, Sameer’s first health cover is group cover so he cannot make any claim. However, for the separate health cover for his parents he can claim Rs. 25,000 and if his parents are senior citizen he can claim up to Rs 30,000. Mukul is 61 year old and is a businessman. His parents are 86 and 82 year old respectively. Mukul pays premium of health insurance for himself and his parents. The premium of his own health cover costs Rs 25,000 for himself and he pays 35,000 for the premium of his parents’ health insurance. How much tax deduction Mukul is eligible for? Since, Mukul is a senior citizen and he is eligible for claiming the entire amount he pays for premium as it is less than Rs. 30,000. He can also claim tax deduction up to the maximum limit of Rs. 30,000 for health insurance premium of his parents which is Rs. 35,000. In total, Mukul can claim Rs. 55,000(Rs. 25,000 + Rs. 30,000). Vinay and his wife Ritika work in a multinational company. Both have corporate health insurance covers. Having understood the significance of a separate health cover, Vinay opts for a family floater health plan for him, wife Ritika and children. Vinay pays Rs 21,000 as premium for a family floater health plan. Ritika bought another health cover for mother in law and father in law who are senior citizen and pays Rs 33,000 for premium. How much tax deduction Vinay and Ritika are entitled to claim? Vinay is entitled to claim up to Rs 25,000 so his total expenditure of Rs 21,000 on premium is eligible for tax deduction. But, Ritika can’t make any claim because section 80D does not allow tax deduction for payments of premium of in-laws. There is another scope for tax deduction under section 80D. You can make tax deduction claim for the money you spend for health check up. You or your spouse or children or parents can opt for health check-up and the maximum deduction that you can claim is Rs. 5,000. However, you cannot claim Rs. 5000 tax deduction for the check-up of every individual. You can claim this amount for the total expense on health checkups of your entire family. For an example, if you spend Rs. 10,000 for the check-up of your wife and mother, you can claim only up to Rs. 5000. This makes the table of total tax deduction more lucrative. The Union budget 2015-16 not only raised the tax deduction limit but also the rate of service tax. The service rate is increased to 14% from 12.36%. This means all policyholders have to pay more on service tax and those who pay high premiums for their family and parents will be benefitted by the higher tax deduction limit. The higher tax deduction is particularly beneficial for older people in late-30s who buy family floater plan worth over Rs 5 lakh including senior citizen parents. Usually these people pay around Rs 45,000-Rs 50,000 annually for the premium of family-floater health plan. People with specific health conditions pay higher premiums as well and they have also found the higher tax deduction limit advantageous. Senior citizens, in spite of being healthy also pay higher premiums. These people have also made the most of higher limit on tax deduction. According to survey, India’s total expenditure on health now stands at Rs. 4000,000 crore per year. However, health insurance cost is only Rs. 20,000 crore or 5% of the entire expense on health. The most prevalent way of medical expense is "out-of-pocket" which is the most incompetent way of managing medical expense. A rise in the tax exemption limit has proved to be a great way to encourage people to consider health policies with higher sum insured and avoid ever-increasing medical cost.